In our San Francisco therapy practice, we see many people who struggle to understand their emotions. Some experience emotions as overwhelming and wish they didn’t feel things so strongly. Others experience emotions as confusing or scary and wish they didn’t have to feel them at all. No matter where you fall on this continuum, you may wonder, “Why do we have emotions?” After all, emotions can be painful. Despite the pain some emotions cause, they are necessary. Without them, you wouldn’t survive. Emotions connect us and communicate to others, and they connect us and communicate to ourselves. Let’s look at each of the functions of emotions in more depth. You, me, your neighbor’s furball of a cat—all have emotions. In fact, thanks to the limbic system, all mammals do. It’s how we’ve stayed alive for as long as we have. Your nervous system lets you know when to run from danger or when to soothe a crying infant. It promotes bonding and socializing. Remember, we humans are social animals and can’t survive in isolation. On the most basic levels, we are interdependent and rely on each other for shelter, food, and medical help. Beyond the basics, we are interdependent, too. Consider, for example, the famous experiment with the rhesus monkeys. Baby monkeys, when separated from their mother at birth, chose the cloth “mommy” without food over the wire “mommy” with food. They needed what is known as contact comfort more than they needed food. This invaluable—albeit disturbing—experiment illustrates that without connection to our tribe we would wither and die. So, why do we have emotions? Simply put, they are hardwired into us. Emotions also motivate you to act quickly in the face of danger. So, if you are attacked, you fight back, run away, freeze, or faint—all of which are autonomic nervous system responses to threat. You don’t have to spend time thinking about how to respond when your life is in danger. Googling “poisonous snakes” or “how to win a knife fight” isn’t an option at that point. But your amazing system already recognizes the sense of urgency and knows what to do. In addition to keeping you alive, emotions motivate you to move towards things that are important to you—to increase your wellbeing and decrease adverse consequences. Anxiety over a work presentation helps motivate you to work hard on it beforehand. Feelings of disgust around a particular person motivate you to move away from them quickly. Love motivates you to care for others and do things that you may not otherwise do. Frustration over an unsatisfying job motivates you to look for new work or change careers. You have to pay attention to your emotions in order for them to help you. Without self-awareness, your emotions can quickly become overwhelming or confusing. For instance, you might be annoyed at anxious feelings that bubble up before giving a work presentation. It’s understandable. Naturally, you want to present yourself in a confident manner and not let your fear show through. Trying to ignore anxiety or push it away with avoidance behaviors will likely only create additional problems. If you can befriend the anxiety, while not letting it paralyze you (a tricky feat! ), the anxious feelings may be able to be channeled into productive work. So, then, why do we have emotions? They light the fire under us. Just think of how a deadline can help motivate last minute, focused work. Emotions also serve as a shorthand for communication to others. The dips and curves of this abbreviated language are communicated nonverbally. For example, when you’re happy, you may smile and present a relaxed posture. If you’re feeling scared, your eyes may widen and you may hunch your shoulders. Even the way you hold your body and the “energy” you give off sends a message to others. Below conscious thought, this dynamic non-verbal communication all happens within seconds. And that shorthand communication is universal, with variations across cultures. Humans can understand each other in a way that goes beyond speech, the written word, or anything verbalized. Sometimes, your emotions may affect others in an unintended way. Even if it’s not what you want, your sadness may make others close to you also feel sad or feel like they want to help you. So, whether you intend them to or not, your emotions will influence and impact other people in your life. Tears, the most influential form of emotional shorthand, let others know you need help, for example. What is the takeaway lesson of it all? Remember that emotions are vital to our species. 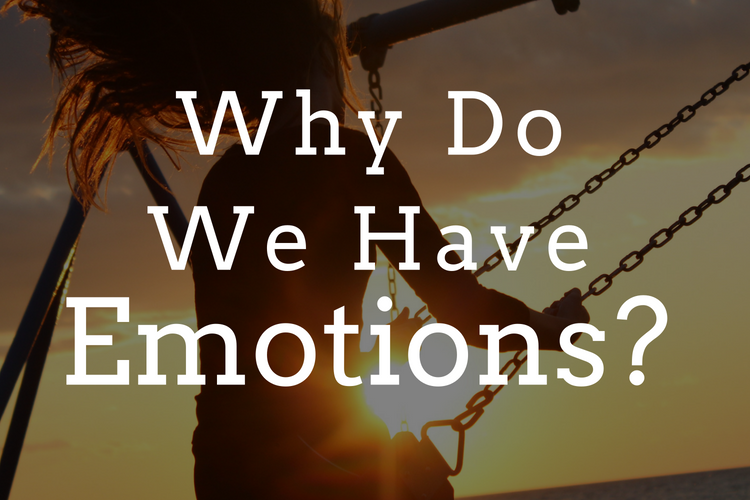 Why do we have emotions? Without them, we wouldn’t survive! Just think about some of the great heroic acts throughout history. Or the small everyday heroic acts like helping a mother carry a stroller over an escalator or giving up your seat on the bus to a senior citizen. All our actions—great and small—are motivated by emotions. *Do you need help understanding your emotions?